This has been a really bad summer so far. Israel’s assault on Gaza has already killed almost 2,000 Palestinians, overwhelmingly civilians. Thousands more are injured, a quarter of the entire population has been forced out of their homes, the power-generating and water treatment plants have been destroyed, and Gaza lies in ruins. The war in Syria continues, largely ignored in the mainstream press. And President Obama has just re-launched his own version of what is still a really “dumb war” in Iraq. Earlier this summer, I was in Tokyo for a UN conference on Palestine. Afterwards, I traveled to Hiroshima for a brief visit, and there I had the privilege of spending hours at the Peace Memorial Museum with several of the remarkable people there whose work and lives are shaped by their commitment to keep alive the memory of the nuclear bomb’s horror, and to use that memory as a tool in the struggle for nuclear abolition. They work tirelessly on that task. But what I found extraordinary was that somehow their 24/7 focus on abolishing nuclear weapons still allowed – even required – them to keep up with other wars, other threats, other struggles. They wanted to know what was going on in Palestine and about developments in the global BDS (Boycott, Divestment, Sanctions) campaigns. We talked about the civil, regional, and global wars raging in Syria. It was while I was in Hiroshima that we first started getting word of moves toward new U.S. military reengagement in Iraq – and we talked about that too. I talked with one of the Peace Museum staff who functions as a kind of international liaison with global peace movements about what the U.S. could do to end the Syria crisis, and agreed that what was needed in Syria would be the same in Iraq. Last week marked the 69th anniversary of the U.S. nuclear attacks on Japan. And the survivors of the Hiroshima and Nagasaki bombs – the hibakusha – and their descendants understand perhaps better than most of us just how important those linkages are. I came home to new reports that conditions in Gaza – already horrific because of the siege Israel has imposed since 2006 – were getting significantly worse. It was partly because of the military government in Egypt cutting off support for Gaza, and Cairo’s destruction of the tunnels used to bring in vitally needed supplies to Gaza from Egypt. But mainly it was because Israel was tightening the siege. Things were looking worse than ever. And then all hell exploded for the people of Gaza. 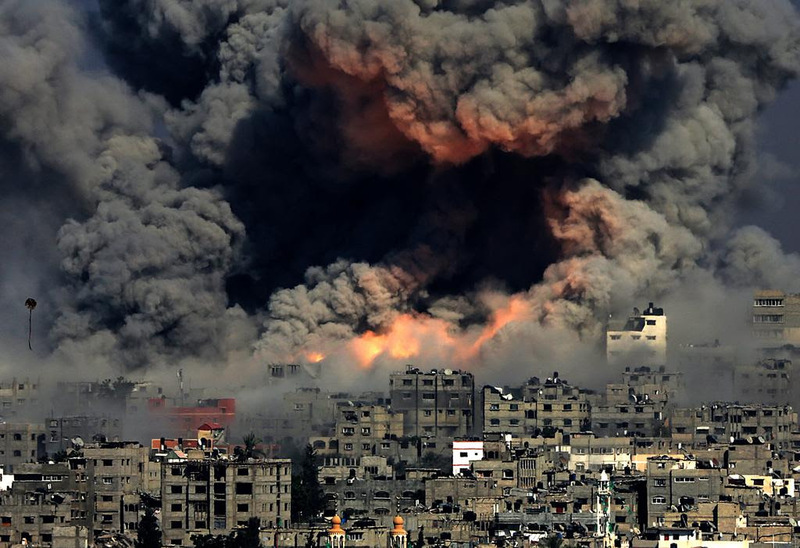 GAZA: WHEN DO WE START THE CLOCK? History is determined by when we start the clock. Did the current Gaza crisis really begin when someone kidnapped and killed three young Israeli settlers in the occupied West Bank on June 12, or did it start on June 11 when Israeli airstrikes in Gaza killed one Palestinian and injured two, one of them a child? Did it start when Israeli soldiers shot and killed two Palestinian teenagers four weeks before that? When do we start the clock? Sixty-four Israeli troops and three civilians have died during the current assault on Gaza. Israeli forces have killed almost 2,000 Palestinians, 80% of them civilians including hundreds of women and kids. Those deaths take place among a population in Gaza –43% of which is comprised of children under 14 – already suffering eight years of profound deprivation and isolation, surrounded by a wall backed by Israeli troops, Israeli naval ships off their coasts, and Israeli fighter-jets and attack helicopters in their skies. Even before the most recent attacks, the UN had reported 90% of the water in Gaza – and there is very little available – is not fit for human consumption. So when do we start the clock? The siege of Gaza began in 2007, 40 years after Israel first occupied the Strip – should we begin there? Two years after the siege began, Operation Cast Lead was launched, resulting in more than 1,400 Palestinians killed in Gaza, of whom 926 were civilians and 313 were children – perhaps we should start there? Or maybe four years after that, when eight days of Israeli air attacks killed 158 Palestinians, of whom 102 were civilians, including 30 kids. Okay, let’s start the clock there, in November 2012. The common calculation in the U.S. press was that it started when Palestinians fired a rocket at an Israeli jeep patrol on the Gaza border, ending a ceasefire. In response, Israel assassinated a Hamas leader. That’s one timeline. But what was going on before that rocket was fired? It turns out that just a few hours earlier, Israeli troops had killed a 13-year-old Gaza boy who was playing soccer. Two days before that, Israeli soldiers had killed a young man walking in one of their “no-go” zones inside Gaza. Israeli officials said, “We called out to him not to go there, and he didn’t listen.” Turns out the young man was mentally disabled, maybe didn’t hear, maybe didn’t understand, continued to walk, and was shot dead. What would history look like if we started the clock then? This time, less than two years later, there’s that timeline question again. Most mainstream voices say the current escalation began on June 12 when three young Israelis were kidnapped and killed in the West Bank. No evidence was shown, and by July 25 Israeli police chief Mickey Rosenfeld had said publicly that a lone cell affiliated with Hamas, but not under its leadership, had been responsible. But the Israeli government immediately blamed Hamas, and launched an almost three-week long series of raids across the West Bank. Israeli troops killed eight and arrested more than 500 Palestinians, including children and a dozen elected members of the Palestinian parliament. Six nights of airstrikes against Gaza began on June 13th. Even before the teenagers’ bodies were found – and egged on by ultra-right-wing elements within the Israeli parliament and government – racist cries of “death to the Arabs” exploded across Israel. One casualty was 16-year-old Mohammed Abu Kheidr, kidnapped and tortured to a horrific death on July 2nd by a group of young Israelis. about “ending the violence,” the only way to do it is to end the occupation – the traditional occupation of the West Bank and East Jerusalem, and the siege form of occupation in Gaza. Military occupation is inherently violent. But too often we identify violence only when it comes from those living under occupation. Or when that “ordinary” violence of occupation escalates to visibly inhuman heights. The everyday violence – the military siege that seals 1.8 million Gazans into an open-air prison, the arrests of children, targeted assassinations – rarely results in international outrage. The attack on Gaza, the third major one in less than six years, is still underway, although a tenuous ceasefire is holding for the moment. 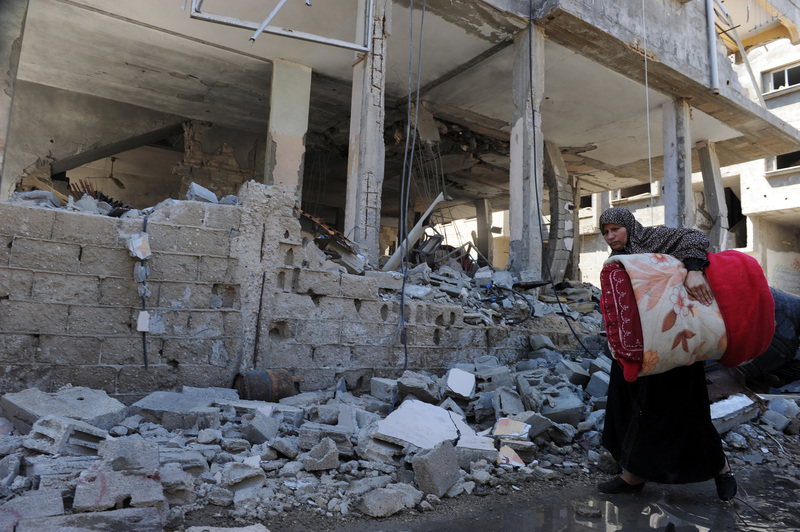 The destruction in Gaza – of lives, homes, schools, hospitals, infrastructure and more – is far worse even than the horrifying results of Israel’s Operation Cast Lead in 2008-09. And the attack was launched against a population that had already been suffering under six years of a stifling siege. There’s been a lot to talk about. Key of course is the role of the U.S. The good news is that public opinion is shifting – with far fewer people uncritically supporting Israeli positions (and significantly, the one demographic left in Israel’s corner is older white Republican men; young people, women, people of color all are much less likely to believe Israel’s actions are justified). But in the U.S. policy arena such shifts are still virtually non-existent. I wrote in The Nation about how it’s no longer political suicide to criticize Israel, and in the congressionally-focused magazine The Hillabout how out of touch Congress is with public opinion. On Al Jazeera’s blog I wrote about the consequences of all 100 senators voting for (or at least standing silent and allowing the appearance of unanimity) an outrageously biased, falsehood-filled resolution supporting Israel’s attack on Gaza. And inCommon Dreams I talked about the House version of that same set of anachronistic pro-Israel assumptions that still shape DC politics. Some Israeli officials tried to distance themselves and their country from one of the most horrific, up-close-and-personal murders, the torturing to death of young Mohammed Khdeir in the West Bank by right-wing Jewish Israelis, supposedly in retaliation for the kidnapping and killing of three Israeli settler students. But the reality is that Israeli racism is rampant and rising, there is overwhelming (90+ percent in some polls) opposition to a ceasefire in Gaza, and incitement to murder comes from the highest levels of Israeli power, including members of the government and the Knesset. I talked about that, and U.S. complicity, on The Real News. And on some of the broader Gaza questions, I talked about the continuation of Israeli violencedespite growing international condemnation, and on Al Jazeera about why the U.S. is not putting real pressure on Israel to stop the violence. That discussion included the issue of possible U.S. fears about escalating Israeli threats to scuttle the U.S.-Iran talks (one of the only potential foreign policy victories President Obama might have a chance to achieve). On Rev. Jesse Jackson’s “Keep Hope Alive Radio” show we discussed the range of the crisis in Gaza, and the potential for a ceasefire. The Israeli assault on Gaza has raised, once again, the question of international law. Understanding Israel’s violations of international law has to begin with the recognition that Gaza is an occupied territory, and that therefore Israel, as the occupying power, has the obligation to protect the occupied population. International law – along with human rights and equality for all – is at the core of what peace and justice in the Middle East, including Palestine-Israel, must be based on. And that means it’s at the core of what we here in the U.S. need to fight for as the basis of a different U.S. policy. I’ve been talking about it a lot. On CCTV early in the crisis I discussed why the Palestine-Israel conflict, between occupied and occupier, is not the same as a border dispute between, say, Ecuador and Peru. With Tavis Smiley I focused on the international law violations (though his follow-up guest, noted neo-con Elliott Abrams, presumably did not). And at IPS we organized a webinar to talk about Gaza in the context of international law. In print, I wrote an op-ed for the Detroit News that focused on Israel’s use of disproportionate force, and other favorite violations of the Geneva Conventions. 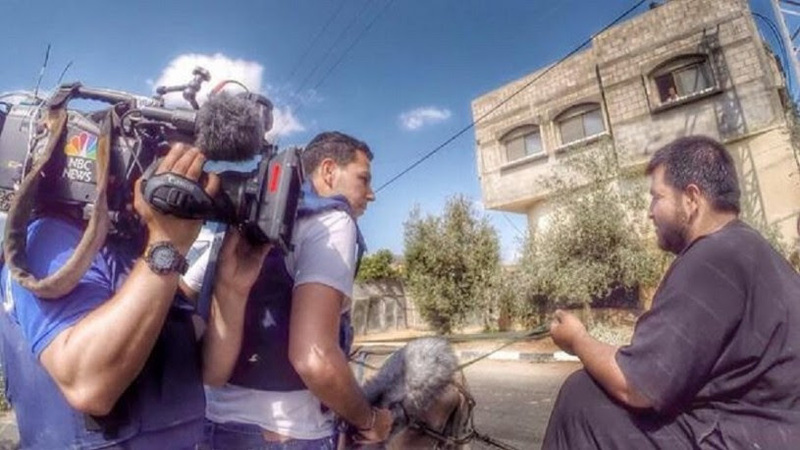 In an op-ed for OtherWords, that was published in a bunch of newspapers as well as on-line, I talked about the range of international law violations Israel was committing in Gaza. And in a piece for Foreign Policy in Focus I described how the continuing violations make a real ceasefire almost impossible. There is some hope – the ceasefire right now is holding, and perhaps international understanding, that for any serious ceasefire will require opening the Gaza borders, is rising. In the meantime work continues here in the U.S. Jewish Voice for Peace organized a terrific briefing on the Hill a few weeks ago, with key congressional staffers engaging with ideas about cutting U.S. military aid to Israel. You can see my part of it here. The BDS, or boycott, divestment and sanctions, movement is rising not only in the U.S. but around the world, bringing non-violent economic pressure to bear on Israel to end its violations. And discussion continues, including at the Palestine Center last week, on potential engagement of the United Nations, the International Criminal Court and other global institutions, in protecting Palestinian rights. It’s less than two months since it began, the direct military re-engagement of U.S. forces in Iraq is now underway. President Obama continues to say it’s only limited involvement, that no ground troops will be involved, that the U.S. is not there to be the air force of the Kurds or of the Shi’a-led government in Baghdad. That may be a true indication of his hopes and intentions. But the problem is, once you’re in, the realities of war take over. If a plane gets shot down or crashes, does anyone doubt there will be boots (or perhaps more Special Forces sneakers) on the ground to rescue the pilot? And of course there are already close to 1,000 troops, mainly special forces, on the ground in Iraq, not to mention some thousands of military contractors as well as U.S. military forces in the Green Zone. And as to what is the U.S. role, Washington is now directly arming the Kurdish pesh merga forces, and bombing in support of both the Kurds and [sort of] the Shi’a-led Iraqi government. So like it or not, the U.S. is playing a military role on one or two sides in a three or four-sided Iraqi civil war. 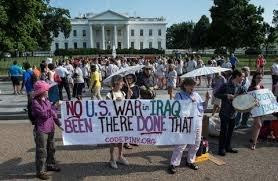 Much of that civil war is rooted in the U.S. invasion and occupation – specifically the imposition of a sectarian-based political system by Washington’s “Coalition Provisional Authority.” So that means we owe a huge debt to the people of Iraq. But we don’t owe bombs, we don’t owe military involvement in an internal sectarian fight. 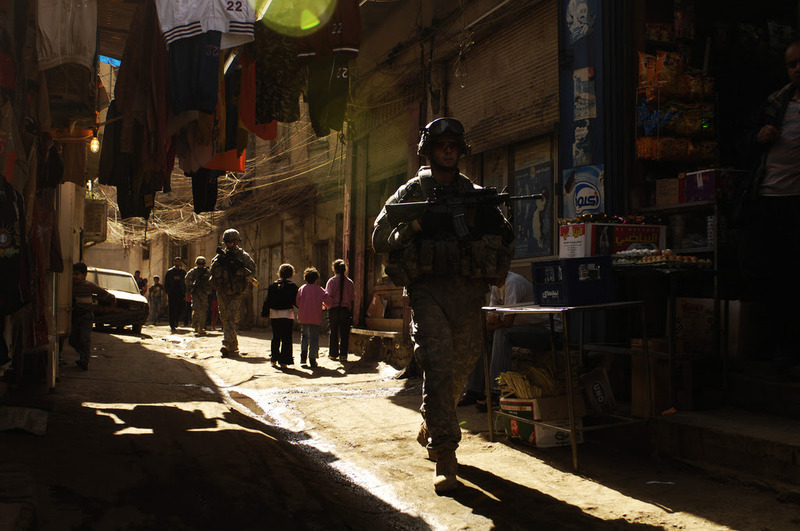 In the early stages of this new Iraq crisis, I joined the Diane Rehm Show to talk about the stakes and the regional implications of the U.S. returning to Iraq. On Democracy Now!, and in an op-ed I wrote for the McClatchy News Service, I discussed the urgency of the U.S. engaging directly with Iran to deal with the new crisis – seeing this as a Nixon-to-China moment, when Obama should go to Tehran. I wrote an overview plea to “Don’t Go Back to Iraq!” and helped organize a bunch of briefings and teach-ins for peace movement activists on how to think about Iraq, ISIS, and the new challenges. And Italked on RT about the link between the Syrian civil war and the latest Iraq crisis. Many of us wrote to the public editor of the New York Times, reminding the paper of its shameful history of buying into Bush administration lies in the run-up to the Iraq war in 2002-03 and beyond, and urging it to stop doing the same thing now. I focused specifically on the Times’ insistence on limiting its too-few critical voices to those former supporters of the war who might have slightly changed their minds, while ignoring those whose longstanding criticism proved right. And the public editor responded – we’ll see whether she has any impact. As I told The New York Times, this is a slippery slope if ever there was one. The need for some help in getting emergency supplies to the beleaguered community, mainly Yazidis, stuck on top of the mountain, is urgent. But even before President Obama’s announcement, there were reports that some humanitarian support, including an evacuation corridor, had been created by Peshmerga forces who broke through IS lines. If accurate, that’s great. If not, the U.S. should support and move urgently to demand that Iraqi President Nouri al-Maliki accept the United Nations offer of technical help on implementing a humanitarian air drop campaign. Dropping food and water isn’t always the same as dropping bombs – but when it’s the U.S. Air Force, with cargo planes full of food and water accompanied by fighter jets and bombers, it’s way too easy for one to segue right into the other. In the region, a return to direct U.S. military involvement in Iraq would inevitably be understood by Iraqis and others as an escalating effort to shore up the discredited Prime Minister Nouri al-Maliki. Long supported by the U.S. despite a legacy of corruption and wide-ranging sectarian exclusion and repression of Sunnis and other non-Shi’a in Iraq, al-Maliki is widely blamed for the recent rise in sectarianism originally imposed by the U.S. invasion and occupation of Iraq. The parliamentary deadline for Maliki’s party to decide whether or not to replace him is only hours away, and the need for a new government, while supported in principle by the Obama administration, will be even more difficult if the U.S. rejoins its longstanding partner with military support. With Obama crediting Maliki’s request as the basis for the Air Force moves, it is virtually certain Maliki will see even less reason to step down from his position. In the region and around the world this will also be seen in the context of double standards because of the Israeli assault on Gaza. 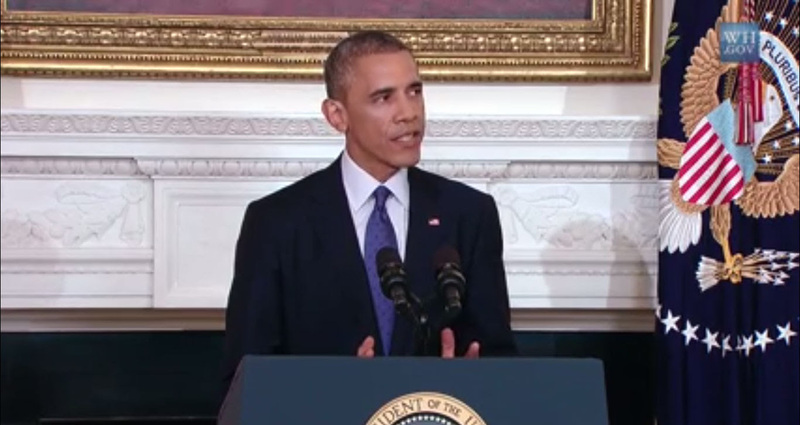 There are 1.8 million “innocent people facing violence on a massive scale” – in President Obama’s words. Why isn’t the U.S. concerned about them, sending an airlift to overcome Israel’s siege, to force open Gaza’s border crossings and let the people breathe in safety? Obama said that “ISIL forces below have called for the systematic destruction of the entire Yezidi people, which would constitute genocide.” Exactly right. And Israeli Knesset Member Ayelet Shaked posted a call to kill Palestinian mothers so they don’t give birth to more “little snakes.” Would that not constitute genocide as well? And whatever else we may have learned from the President’s “dumb war,” it should be eminently clear that we cannot defeat Islamist extremists with bombs and airstrikes. Every bomb recruits more supporters. As President Obama himself said, there is no U.S. military solution in Iraq. So why is he authorizing U.S. military action? Public opinion is against it – we talked on MSNBC’s “Up With Steve” show about how progressives are mobilizing against it. And blowback will soon be coming. By the way – the F-18s Obama is sending to attack Iraq are being launched from the aircraft carrier U.S.S. George H. W. Bush. No, you can’t make this stuff up…. Thanks for all your work, all your passion, all your support. It’s been a long summer. And it’s not over yet. We have a lot of work left to do.